Captain John Staple’s exploits in the Peninsula had earned him the sobriquet Crazy Jack among his fellow Dragoons. Now home from Waterloo, life is rather dull. But when he finds himself lost and benighted at an unmanned toll-house in the Pennines, his soldiering exploits pale away besides an adventure — and romance — of a lifetime. I have come to the conclusion that I am just one of those people who can’t appreciate Heyer’s work. In the romance community, she is the one recommendation that people come up with for realistic romances, but they just leave me feeling not quite complete. Don’t get me wrong, they aren’t bad, they just aren’t for me. 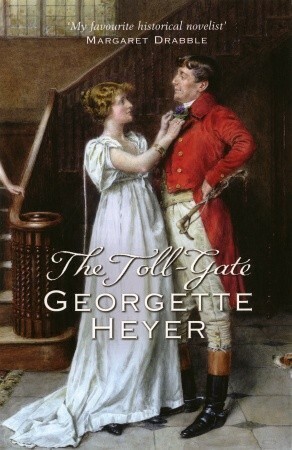 In this instance, I have to admit that I preferred the mystery aspect of the story (what happened to the Toll-Gate keeper) to the romance which was a bit ehh. It almost ended up being an insta-love situation, I never truely felt like there was any romance between the 2 main characters. In conjunction with the iffy romance in the storyline, I wasn’t a huge fan of the narrator. I think he did an ok job with the various adult male voices, but the female ones, as well as the young kid who was fairly significant in the book were only ehhh. They all just started to blend together after a while, which isn’t necessarily a good thing. I had debated actually DNF’ing this at one stage, but decided to see it out. The ending was satisfactory with how the mystery was solved, and the narrator’s voice sorta grew on me, but not enough for me to want to seek him out again in the future. Overall, i can only give the book and narration 2 stars.